I'm feeling lucky that although I live between two towns that were affected by tornadoes last night, we were unharmed and had no damage to our house or farm. My heart breaks for people who have to literally pick up the pieces of their lives when others, like me, get by with no more than luck and faith. Please pray for those who have to start new and for those who lost family members. I know I've said it a million times before, but I feel blessed to have such wonderful readers. We are all trying to do the best for our students that we know to do and sometimes, we can't do it on our own. I am humbled by the sweet comments you leave and the emails I get from you. You are an inspiration! 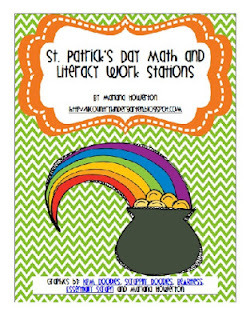 To celebrate the first day of March tomorrow, I've posted a St. Patrick's Day Math and Literacy Work Stations Mini Unit that includes 37 pages. Feel free to click on the picture below to purchase this mini unit from my TpT store. Wow is right! Your unit is super cute and creative! Thank you so much for sharing! AMAZING! Thank you for sharing such a fabulous unit! I love the base ten-ten frame match up! We are working on this right now, so this will be a perfect math station! Thank you soo much for the great fun March activities! Thank You, This is wonderful...it will be perfect for my daughter this week! I'm glad to hear that your family and property were safe from the storms! Oh my goodness! I feel like I won the giveaway you had@ This unit is awesome and will help me out so much with my kindergarteners! Thank you so much again for being so generous with a unit we can use! What a lot of work. Thank you for sharing! Thank you so much for sharing! I am super excited about the -ot book becasue I am introducing that on Monday!!! I am so happy you are safe and sound. How scary! Thank you for your generosity in sharing this wonderful unit! There are so many pieces that I will be putting to use! Thank you! Thank you, thank you, thank you...this is an awesome packet! Your readers sure are L*U*C*K*Y to be following such an amazing teacher like you! Thanks so much for making this available! You are AWESOME!!! Marlana I have just been awarded the Lovely Blog Award and now I would like to award it to you. Come on by and check it out! Many thanks for this great freebie although it is crazy to believe that we are already planning for St. Patrick's Day! I'm not sure exactly where you are located, but I have been praying for the many people that have been affected! Thank you so much for being generous! My students and I love the Write the Room activities and Spin and Graph! this is GREAT!!! thanx for sharing!!! Wow! This looks like it was so much work to make! I love it! Thank you for the wonderful activities Marlana! These will be perfect to use as centers this month! I appreciate you sharing your hard work! Wow....thanks so much for sharing. I really appreciate it! Keep up the great work. This is fabulous! Thank you for being so generous. WOW! I can't believe that this great resource is FREE! Thank you so much for this wonderful freebie. I can't wait to get it printed off and use it in my classroom. You are awesome! Thank you so much for the wonderful freebie! I can't wait to print it and use it with my kinderkids. Wow! Thanks SOOOOO much for all of these great activities! I love St. Patrick's day but am seriously lacking in themed activities. I am so grateful that you are willing to share such great ideas. I am sure that it took a great deal of time to create all of this. Thank you, thank you, thank you! This is fantastic! You have wonderful ideas!!! THANK YOU!!!! This is so generous of you! Thank you! I have an award for you on my blog. If you have time come check it out! Thank you for the wonderful ideas! You just made my planning so much easier! Thank you for sharing all your great ideas. They are much appreciated. Thank You so much for this freebie. I have just recently found your blog and love it. Your ideas are wonderful. Thank you for sharing! Thank you ever so much with your generous gift to my students and me. You are very kind sharing your hard work. Happy St. Patrick's Day to you. Thank you so much for sharing your wonderful ideas! My class has LOVED your 100 chart pictures! Wow, thank you for being so generous. I can't wait to use this with my kiddos. Thank you to everyone for your sweet comments! I am happy to share! I hope you and your students find these activities useful! Thank you so much! I have everything ready to go for next week to use with my Title I kinders. Thanks again for your generosity. Thank you for sharing your wonderful activities! Wow! This is so generous of you! I just shared this on my blog and linked back to you! I know others will really appreciate all your hard work. Thank you so much for all of the freebies! This is great! My students will have tons of fun with it! Thank you for sharing this. I wanted to let you know that I truly appreciate all your hard work and creativity. Amazing! I feel like I have been blessed with the "Luck o' the Irish" finding your blog and these wonderful "freebies!" Thank you, thank you! I want to let you know that my Title I kiddos really got into the Write the Room words. I told them that the leprechaun came and turned popcorn words into shamrock words and hid them around the room. They also enjoyed the op words spinner game today. Thanks for the wonderful unit!